Two weeks ago, President Obama announced a significant policy shift that will help low-income students access college financial aid by making the Free Application for Federal Student Aid (FAFSA) simpler to complete. This key administrative change will allow applicants to complete the FAFSA using income tax data from two years prior to the current year. This change is a major win for students, significantly simplifying the aid application process. Forty percent of students who said they didn’t complete the FAFSA because it was “too much work” would have qualified for a Pell Grant. Allowing applicants to use income from the “prior-prior year” (two years ago, instead of just the prior year) will make it easier for students to apply for aid using the IRS Data Retrieval Tool, which can automatically import their tax information into the FAFSA. This will save students time and paperwork and allow them to apply for financial aid earlier. By accessing more relevant information further in advance, students will be able to make more informed college decisions, as well as apply for state and institutional grant aid that is given out on a first-come, first-served basis. 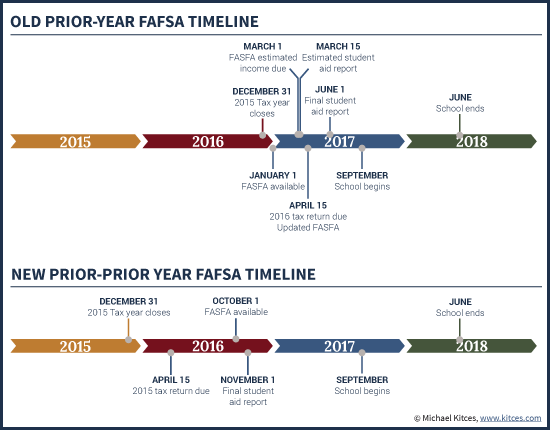 Under the current rules, applicants must wait to complete the FAFSA until January 1 of the year they plan attend a higher education institution. Additionally, they must verify their household income using their most recent tax data. For instance, a senior student (class of 2016) completing the FAFSA would not be able to access the form before January 1, 2016 and would have to use their and their parents’ 2015 tax data. Starting with the 2017-2018 FAFSA form, the announced change will allow students to access and submit the form three months earlier—beginning October 1 instead of January 1—and use the tax data from two years prior (in this case, 2015 income data rather than 2016). According to a report on the potential impact of a prior-prior year policy, independent students without dependents are most likely to see a change in their Pell award of $1,000 or more when using tax information from two years prior. Additionally, while this policy will help many students obtain the financial aid they need, it is will also let families estimate their need at different colleges before even applying. Using the current, “old” system, senior students would have to wait until Spring semester to send financial aid applications to colleges. The colleges would need to evaluate students’ financial need and send award letters quickly, before the May 1st reply deadline for students to select one college. Under the new system, that senior student can send the FAFSA starting in October of his/her senior year. Not only with students, parents, and families have more time to send applications and evaluate choices based on costs, but colleges will also have more time to evaluate applicants.